Installing traffic signals is another easy and exciting way to add more realism to your train layout, especially if they're automated. Model Power fortunately manufactures ready-to-install traffic light kits made of brass with incandescent lights. If you're handy with miniatures, you could potentially change the lights to 3 or 5mm LED's which would have the advantage of lasting longer than the incandescent bulbs, although you would have to include a 1000 ohm resistor for each traffic light. You could just take each traffic signal out of the box and connect it to your power supply. A selector switch is included so you can manually change the lights from green to yellow to red and back. If you hook up several of them in parallel operated with one switch, you could synchronize the lights if you wish. As neat as that is, I think it's even better to automate the traffic lights so that they change automatically without you having to throw any switches. That way, you can concentrate on running your trains while all of your lighting effects are occurring by themselves! How do you automate these lights? You need a circuit board that is designed for this. Enter Circuitron TL-1. This board will automate changes for up to 6 LED's or incandescent lamps as long as all the lights use the same voltage and amps. Thus, you would need one circuit board for every 2 traffic signals (3 lamps per signal) that you want to automate. Also, the changing times for the red, yellow and green lights are adjustable. The wiring diagram and instructions are included when you buy the circuit board. You can use either AC or DC power (10-18volts) connected to the + and - terminals on the board. You should probably solder these wires on to the connector pins on the board so the connection will remain stable. 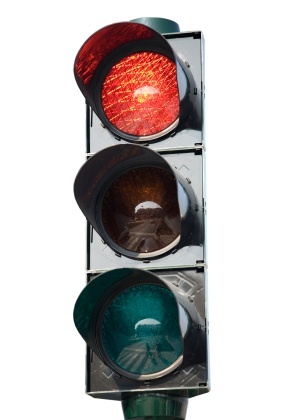 If you're using incandescent lamps, connect the black (common) wires from each traffic control signal to the "L" connector pin. If you're using LED's, connect all the positive leads from the LED's of one traffic light to one 1000 ohm resistor(1/2 watt-rated) then connect the other end of the resistor to a wire that goes to the "L" connector pin. Then take the colored wires from one traffic control signal and solder each one to the corresponding connector pin (R1, Y1, G1). Do the same for the second traffic control signal connecting each of the colored wires to the corresponding pin (R2, Y2, G2). Although it would be nice, to save money, to connect more that 2 traffic signals to each board, but Circuitron advises against this. On the board there are places where you can use a small screw driver to adjust the amount of time that each light will go on and off. This may take some time to get them adjusted just right. When you're done you've got another great automated enhancement for your layout! From "Traffic Signals" to "Special Effects"
From "Traffic Signals" to "Model Scenery Roads"